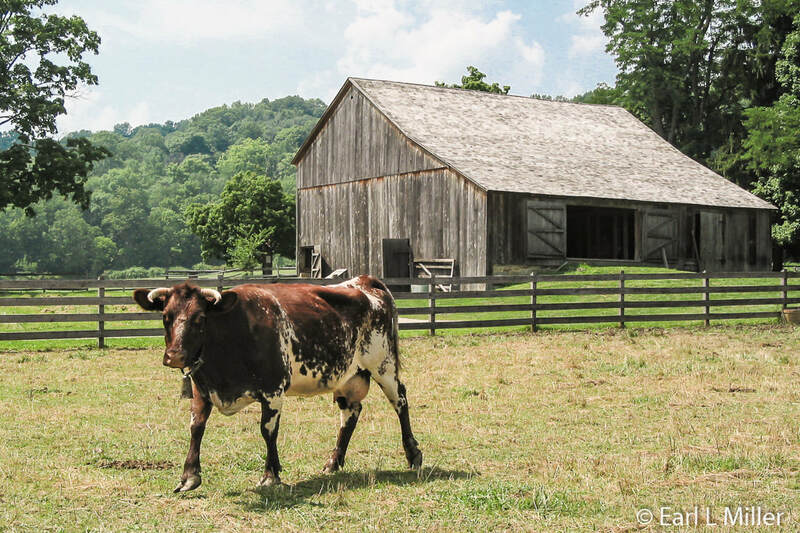 Imagine a place where you can go to experience a working farm, see 32 historic structures, and watch living history craftsmen demonstrate various arts and trades. 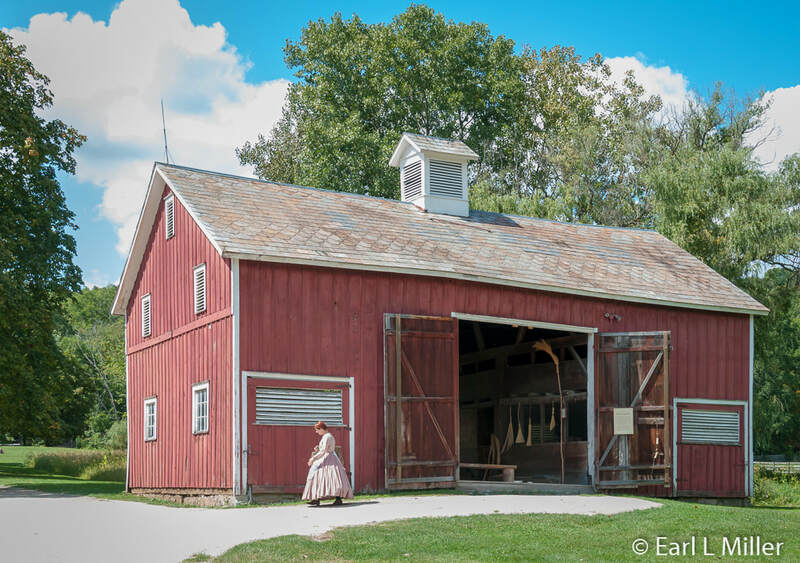 At Bath, Ohio’s Hale Farm & Village, a museum of the Western Reserve Historical Society, travelers enjoy all of this. It’s a place depicting rural life in the Connecticut Western Reserve from Jonathan Hale’s arrival in 1810. It represents the 1850's. Located within Cuyahoga Valley National Park, it's also one of its partners. The Connecticut Western Reserve was land claimed first by the colony of Connecticut and later by the state. They based their initial claim on a charter granted to the colony by King Charles II of England in 1662. It stretched between the Atlantic and Pacific Oceans. Following the American Revolution and preceding the 1787 establishment of the Northwest Territory, the new states relinquished claims to their western lands. This was done in exchange for the federal government assuming their debts. Connecticut gave up most of its land but held onto a 120-mile wide strip in Northeast Ohio between Lake Erie and a line just south of what is now Youngstown and Akron. This was done because of legal issues of overlapping land claims with New York and Pennsylvania. In 1796, the state of Connecticut sold most of this strip, more than three million acres, to the Connecticut Land Company for $1,200,000. This was to entice settlement and speculation. Previously, in 1792, the westernmost 500,000 acres had been sold as compensation to Connecticut residents who had lost property to British raids during the American Revolution. This land is referred to as the Firelands. Jonathan Hale, a farmer and a native of Glastonbury, Connecticut, had purchased 500 acres. He left the East with a team of horses on June 12, 1810 on a 646-mile journey to the Western Reserve. Upon arrival, he found a squatter on his land which was a common practice in those days. He traded his horses and wagon for the cabin and cleared land. His wife, Mercy, and their five children arrived later that year. Hale was the first legal settler of Bath Township, Ohio. Three generations of Hales lived on the farm. In 1956, Clara Belle Ritchie, Jonathan Hale’s great granddaughter, bequeathed it to the Western Reserve Historical Society (WRHS) to be used as a museum. The purpose was to inform as many people as possible about the history and culture of the Western Reserve. During its first decade, visitors had tours of the Hale House and saw demonstrations of early American crafts and trades. 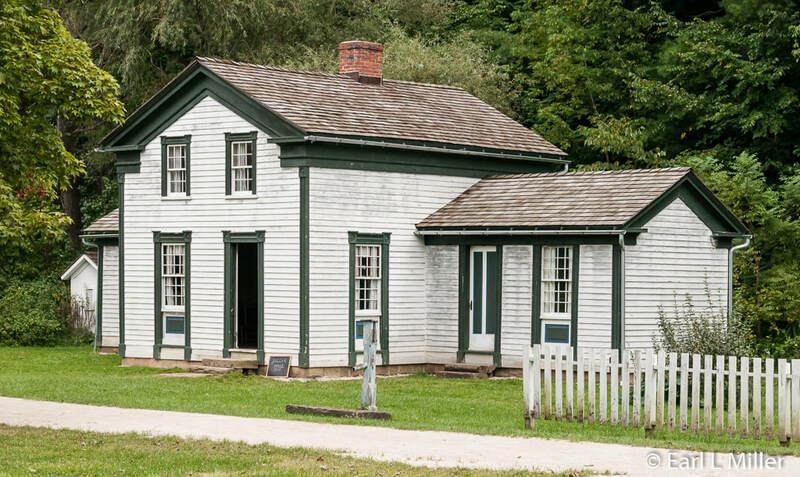 The WRHS decided to create an outdoor living history museum similar to such models as Dearborn, Michigan’s Greenfield Village and Sturbridge, Massachusetts’ Sturbridge Village. Representatives from the WRHS including Hale Farm’s director, Mr. Siegfried Buerling, traveled east to study New England’s museum villages and towns. They also reviewed Western Reserve towns and villages. Based on this and extensive historical research in the WRHS archives, they developed a plan to create a Western Reserve village across the road from the Hale House. The WRHS launched a “Preservation through Relocation Program” to create their village. They found pre-Civil War era historic structures that were threatened by demolition and moved them to Hale Farm. These were restored and located around a village green. All buildings had to come from within the Western Reserve boundaries and built before 1850 or stylistically fit into the period. They were not moved if they could be salvaged at their original site. The buildings were to represent a variety of architectural styles and lifestyles. The village green was to be typical of other village and town centers in the Western Reserve. The first stop is the Gatehouse Visitor Center with its Marketplace. There you can find goods produced in the village as well as crafted items made by more than 40 local Ohio artists. It is open during seasonal museum hours. It’s also the place to pay your admission. I was sorry to see that the film about Hale Farm & Village is no longer being shown. I had seen that on previous visits and thought it gave a great overview. I was told that they thought the film was too old. Unfortunately, no exhibits exist at this building. Good walking shoes and lots of time are required at this attraction since it spans over 90 acres of land. There are some benches scattered around the property. The Hale house was constructed between 1825 and 1827. The three story structure was one of two all brick buildings in the area. Hale produced bricks for his home from materials found on the site and later sold them when the Ohio & Erie Canal opened in Akron in 1827. When C. O. Hale, his grandson, owned it during the late 19th and early 20th centuries, he and his wife, Pauline, opened the home to guests and boarders. This was a major part of their income since he was not interested in farming. 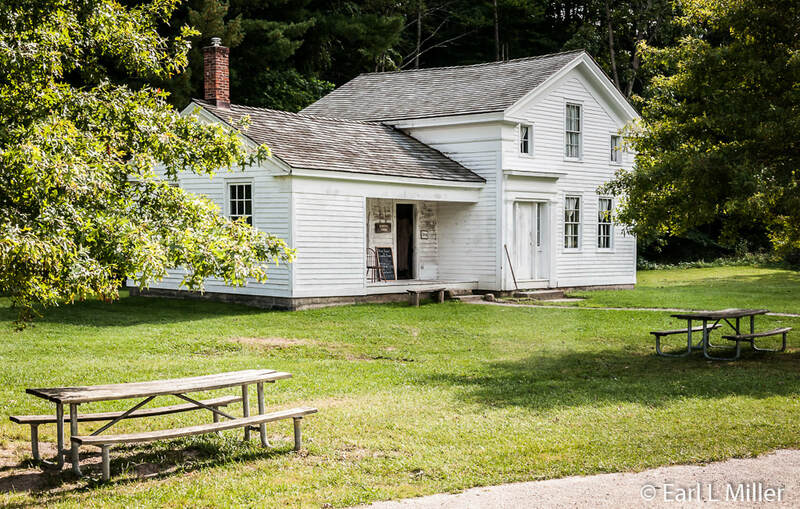 A one million-dollar project involved the stabilization and restoration of the existing house so it could be exhibited by Hale Farm and Village. This was done in two phases: 2003 and 2008. Restoration efforts returned it to circa 1850. 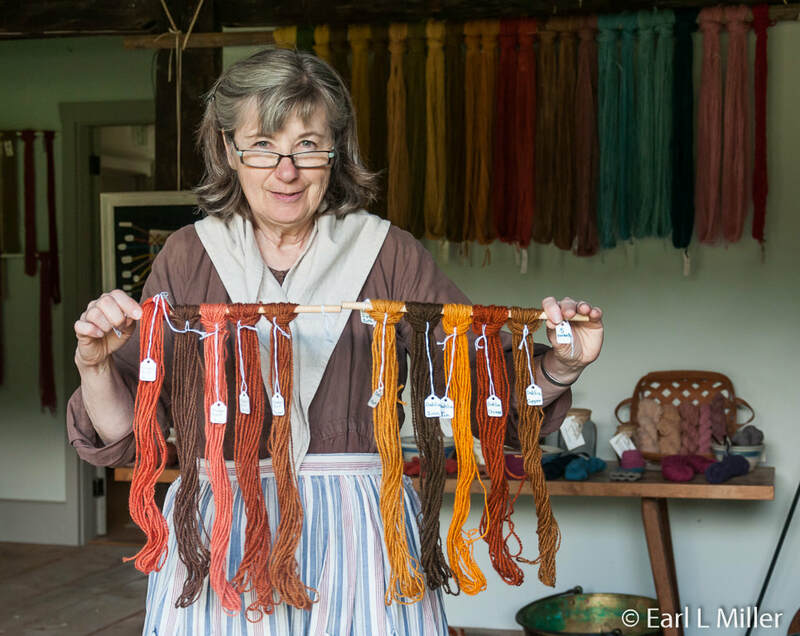 Since the home has been redone, it’s now the place to see spinning, weaving, and dyeing demonstrations. We listened to Becky Monegan, in the home’s back wing, tell us about the dyeing process. The different colors come from flowers, leaves, trees, bark, roots, and nuts. The Arizona Cochinella bug makes pinks and reds and was used by the wealthy. Brown comes from black walnuts, gold from the Goldenrod, and dark orange from the Root of Madder. Blue is obtained from indigo leaves, yellow from onion skins, and greenish yellow from red onion skins. Green is made by dipping any of the yellows into the indigo. After about 1850, there were commercial dyes available. Enough of a dye must be made at one time since the color consistency can vary. What affects color are the amount of yarn, the water the dye is in, and the amount of the dye. Plants are boiled for an hour. The dye is then strained and placed on the wool for 20 minutes to an hour. 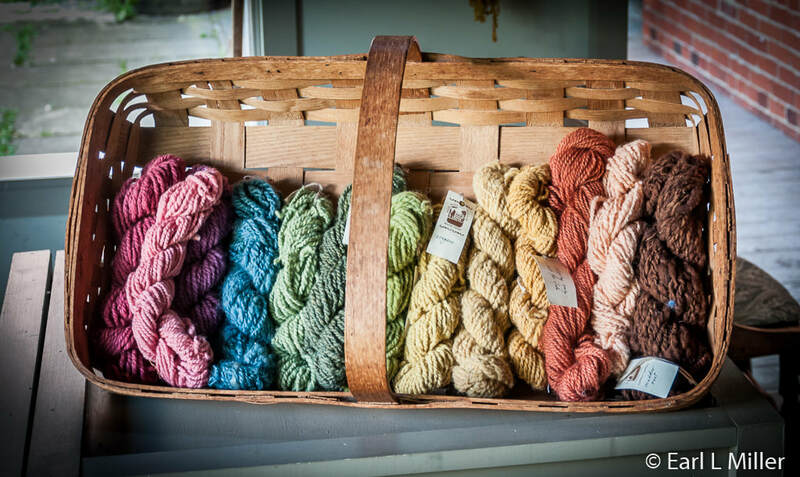 “Making natural dyes is a big science experiment,” said Becky. She then took us to see the six working looms which filled the whole room. The oldest one dated to the early 1800's while another is 180 years old. 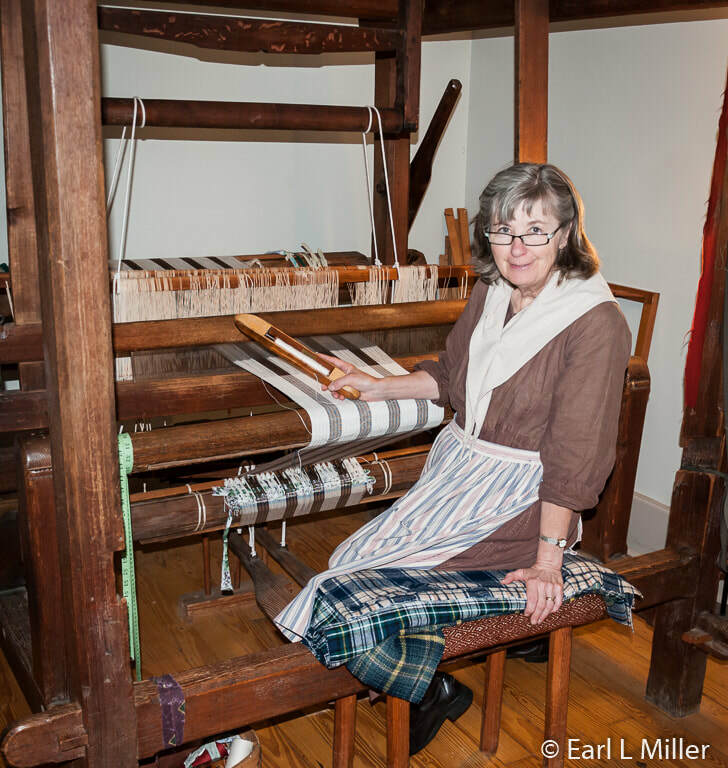 Becky is currently weaving towels on their oldest loom. It takes 12 hours to thread a loom and two hours to weave a 25-inch kitchen towel. She has woven all the rugs for Hale Farm and Village. This included all the carpeting from the meetinghouse. It was a project that took more than 15 years. At times, both of the oldest looms had carpets being woven on them simultaneously. Hale Farm & Village now does spinning in the summer kitchen built by C.O. Hale in 1890. Carmel Oberdorfer handles spinning demonstrations. 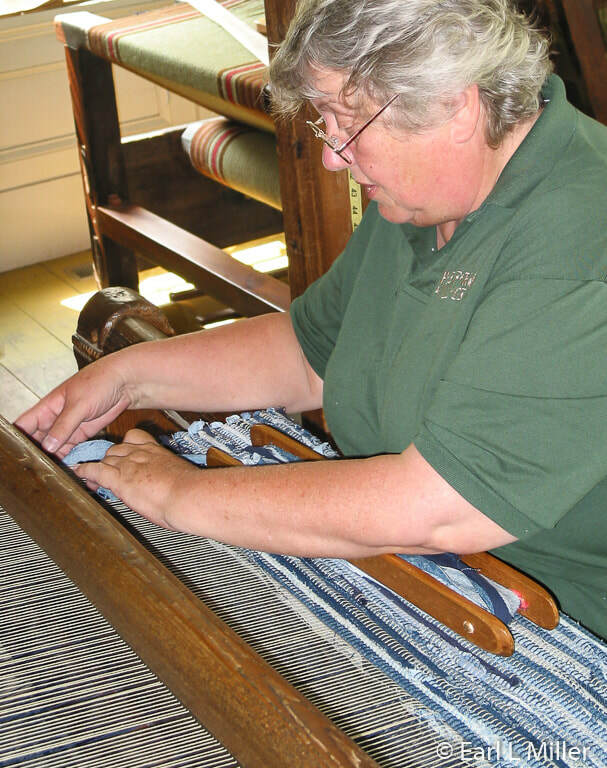 She had been weaving for many years before learning to spin. Since wool has an oil feeling to it due to lanolin, it’s essential to wash it two to three times in hot, soapy, boiling water. The Hales used lye soap. She uses Dawn detergent. Leaving some oil in makes wool waterproof but also makes it smell like sheep. Every hair of wool has microscopic barbs which supply strength but are itchy on bare skin. After washing, the wool is carded (combed). Children, at age eight, carded as a chore. 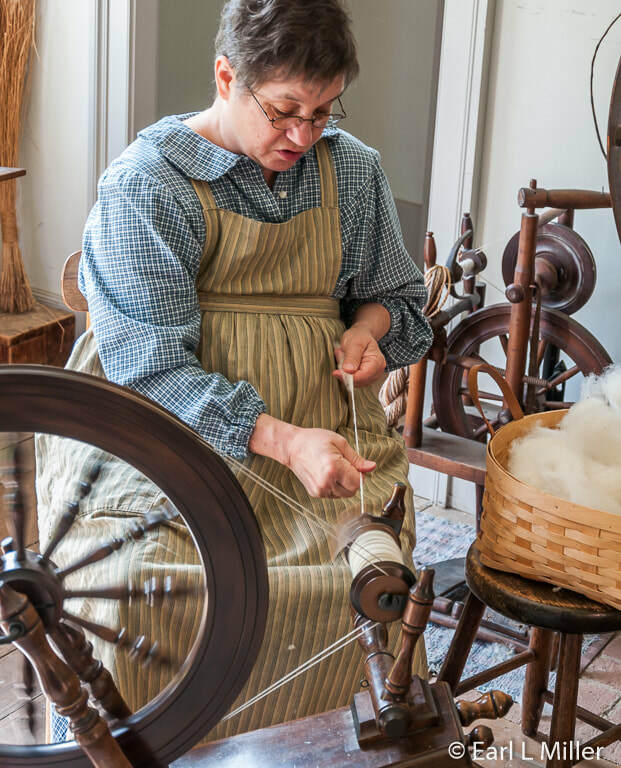 After about 1820, there were commercial carding mills where people could send their wool. The process helps to separate the fibers and get rid of debris. It also gets the fibers all going in the same direction. The wool is carded four times until its back looks like the front. The eldest daughter pulled wool off of the card and spun it on a spinning wheel using a foot treadle. It takes one hour to spin 80 yards of wool which will make half of a mitten. The Hales lived in a log cabin for 15 years after they arrived in 1810. That cabin didn’t survive since Hale took apart the structure and used its wood in his brick home of 1825. 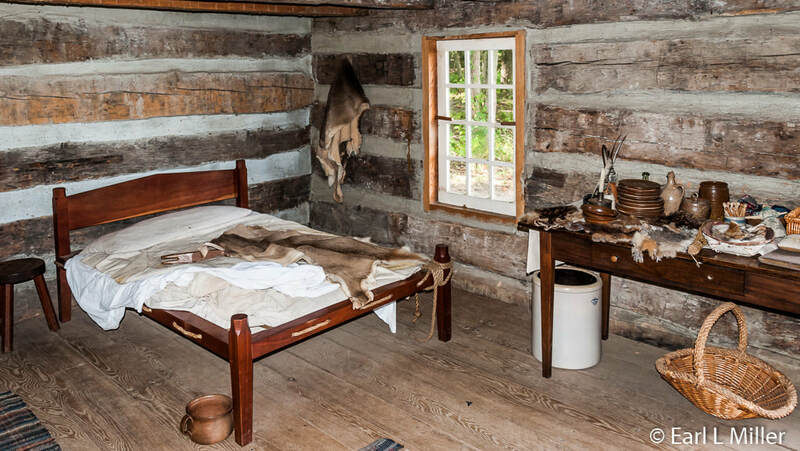 Instead, the Fritch log cabin, dated 1805 from Suffield Township in Portage County, is portrayed as his. Goodyear Tire and Rubber Company purchased the property where the Fritch cabin was originally located. They used the structure as a hunting cabin for executives and clients. It was moved to Hale Farm in 1995. Joe Skonce told us about the cabin. He advised that its construction shows it was meant to last awhile. Its beams were hand hewn, and it also had a big, sturdy hearth. The Fritch family of nine children used the loft upstairs. It was the children’s bedroom. The Hale sheep barn, dated 1898, was built by Andrew Hale. 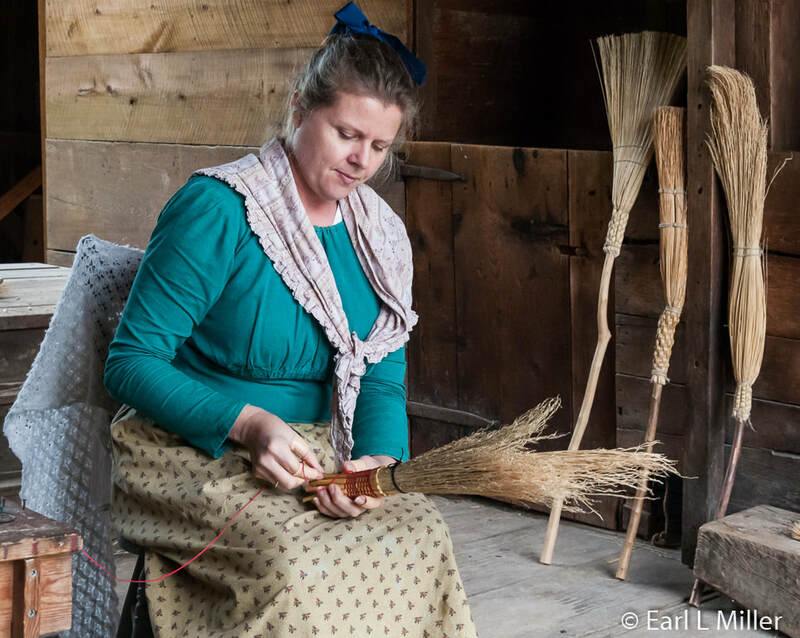 Here you can see broom making and learn about the different types of brooms. In the early 1800's they used broomcorn which is not corn but instead related to the sorghum family and sugar cane. Kirsten Fitzgerald demonstrated the procedure on how they make them. Hers are made from broomcorn which is mostly ordered from South Carolina. The broomcorn is soaked in a bucket of water for one hour to make it pliable then laid out to dry. Each broom has three layers with the outer stalk left longer. The handle is a sapling which has had the bark shaved off. Finally, the ends are cut off evenly and hand stitched. Different types of brooms exist. The round broom is called that because the ends are rounded off. The Shakers cut theirs straight across and called it a Shaker broom. 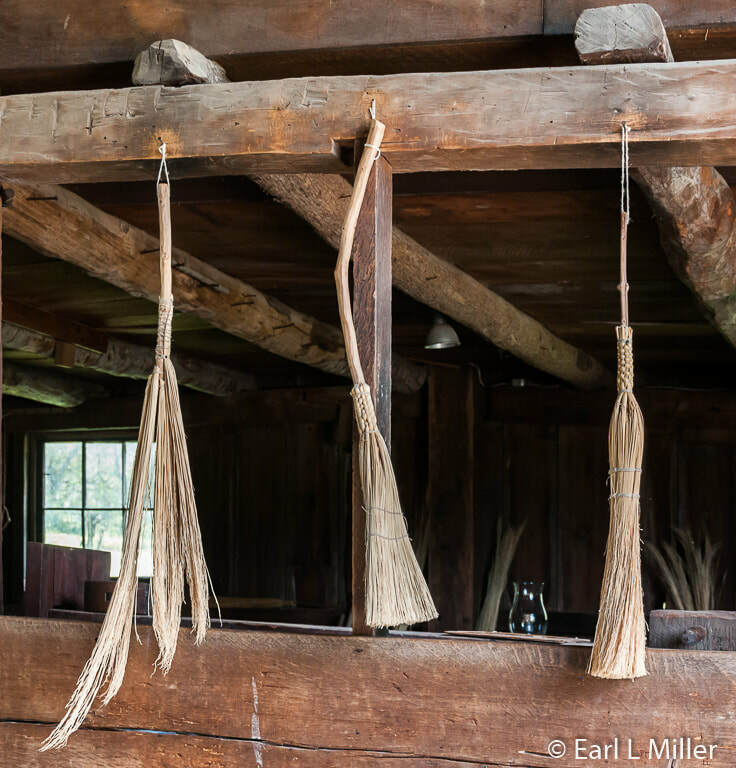 Another is a barn broom used in the barn. A broom belonged to the house and not the person. When people moved to a new home, they needed to get a new broom. C. O. Hale had a “guest house” trade in the 1870's. At one time, as many as five of these cottages might have existed on the property. This is the place to watch candle making. When we were there, Rhianna Gordon was demonstrating her craft. She told us that people traditionally made candles in the fall. They were used sparingly as only 200 to 250 were made for the season. In the Hale days, they used mostly tallow (animal fat) from the farm animals they had just butchered. Today they use beeswax with paraffin. Beeswax lasts longer, smells nicer, and is easier to use as is sturdier. Tallow droops but is really pliable. Now the wick is made by cutting braided cotton into pieces that are the correct sizes. In the old days, they used tow which is combed flax twined into a wick. The wax is melted to a temperature of 140-160 degrees. Then it takes 20 to 30 dips to make a candle. Each inch takes an hour to make with beeswax candles being seven inches tall. Candles in Hale’s time were white though beeswax is a golden yellow. They didn’t have the time to color them. When they were finished, as animals would eat them, candles were hung on ceilings and tacked onto walls. The sugar house on the property dates to 1910. It is located adjacent to the sugar bush and the nature trail. C. O. Hale used it during the early 20th century. Hale Farm and Village introduced a maple sugar demonstration in 1983 and now has an annual festival in March. At the Maple Sugar Festival, visitors tap maple trees and haul sap to the sugar house. Staff demonstrates how to boil tree sap into syrup using evaporation. The sawmill, which no longer operates, is next to the sugar house and is not original to the site. Other original Hale buildings are the farm barn built by Andrew in 1854, the 1874 carriage barn, the 1920 corn crib, and the 1850 outhouse. We didn’t check it out this time, but the farm barn was and is the home of animal pens. Visitors are able to view sheep, cattle, horses, and chickens. They can also see early farm equipment. It’s on the opposite side of Oak Hill Road from the house. The carriage barn was used originally to store carriages and wagons by the Hale family. It now houses museum livestock. Wheatfield, a town that never existed, is the name of the village across the street from the home. Here historic buildings have been placed around a village green. 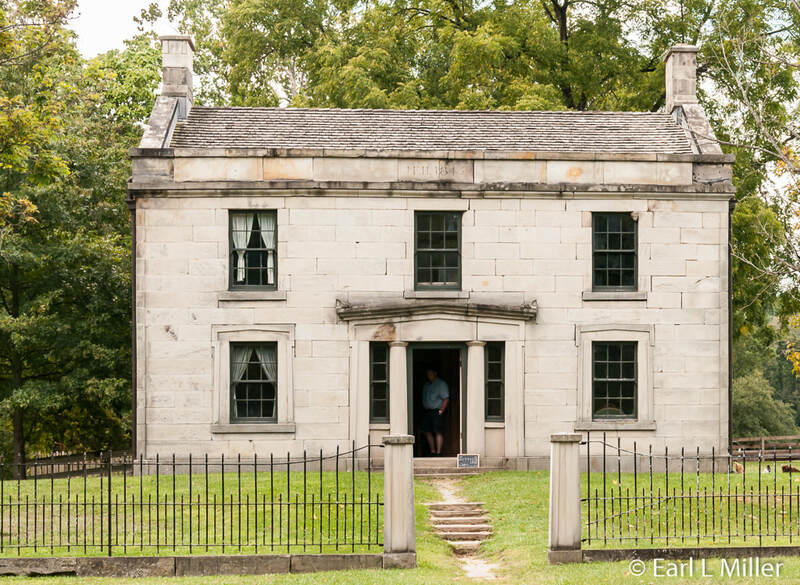 The Jonathan E. Herrick House is an 1845 sandstone Greek Revival from Twinsburg, Ohio. Hale’s brother had a quarry which is how Herrick obtained sandstone so cheaply. Of the more than 7,500 Western Reserve homes listed on the Ohio Historic Inventory, less than one half of a percent are square-cut stone structures. The house was placed on the National Register of Historic Places in 1974. It was brought over to Hale Farm in 1987. All 970 stones of it were disassembled, numbered, then reassembled. A historical grant was obtained to move the house with Kent State University architectural students assisting with the project. They worked via original blueprints. The Herrick family had paint samples of actual walls. Herrick was a dairy farmer and town trustee for Twinsburg. He had followed his brothers from Massachusetts to the Western Reserve during the 1820s. He purchased farmland in Twinsburg where he married and raised a family of three children as well as foster children. The Herricks lived in the home until 1898. It’s interpreted as the home of a successful dairy farmer. 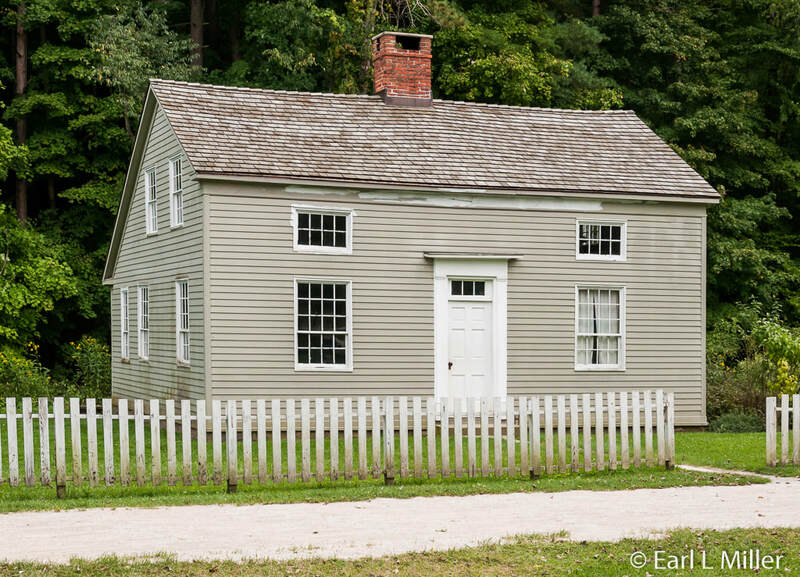 The Saltbox House is an 1830 Federal home that was originally located in Richfield, Ohio. It represents the Village’s earliest dwelling and is furnished simply. A craftsman would have lived here, possibly a blacksmith. The emphasis is on rural domestic life circa 1830. Visitors find an extensive herb garden outside. 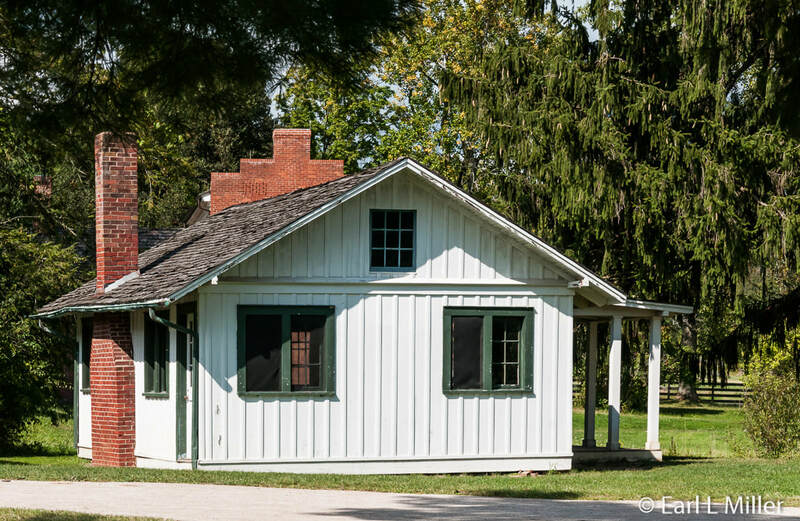 The Jagger House is an 1845 Greek Revival from Bath, Ohio. Its owner, Clement Jagger, was a surrey maker. Hale Farm notes it for its paneling and original stenciling. It has been made into the home and office of Dr. William Tibbals and his family. The Jonathan Goldsmith House, circa 1830-1832, is from Willoughby, Ohio. It’s a Classical Revival combining elements from Federal and Greek Revival styles. It was originally built for the William Peck Robinson family who came from New Haven, Connecticut. Robinson owned several mills and a sizable farm. He was a man of considerable means. It was named for its builder and architect, Jonathan Goldsmith, regarded as one of the finest architects in the Reserve. The home is considered to be the most luxurious house in the village. The Stow House is an 1852 Greek Revival from Stow, Ohio. It was first used at Hale Farm as a residence for the farmer and on-site security staff. Then it housed spinning and weaving demonstrations. 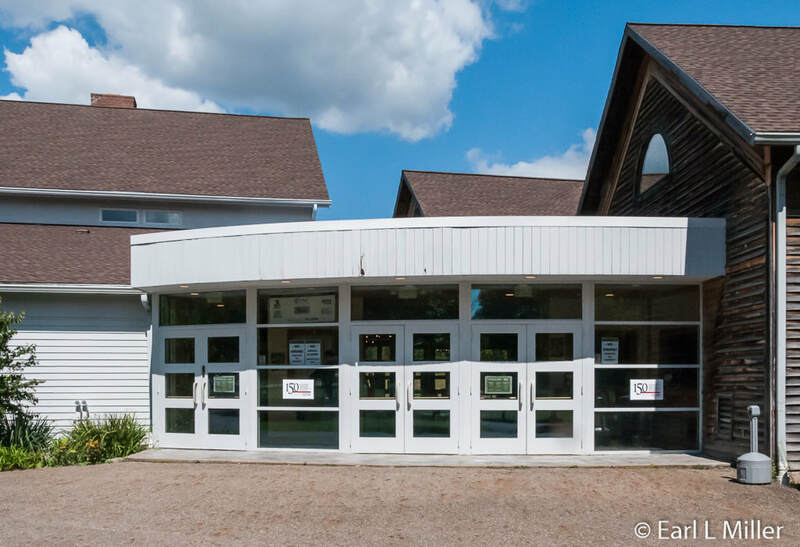 It’s now the village general store serving as a retail outlet for the Gatehouse Visitor Center's Marketplace. 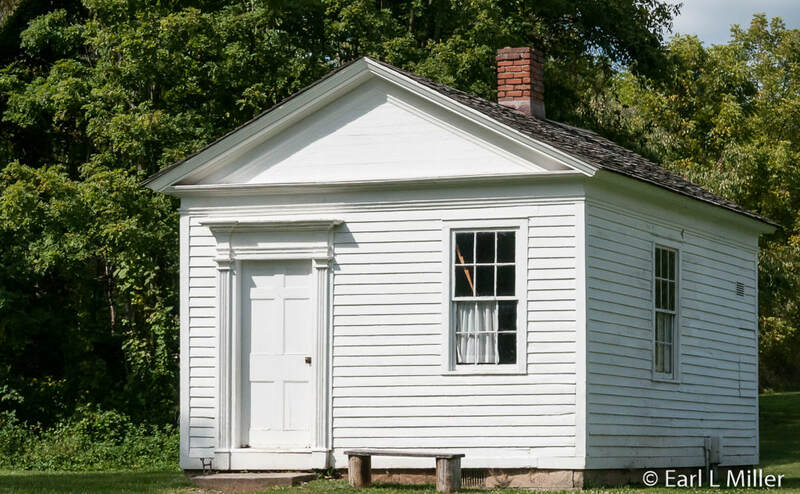 Built in 1816, the schoolhouse came from Summitville, Ohio which is outside the Western Reserve. It’s used because of two reasons. 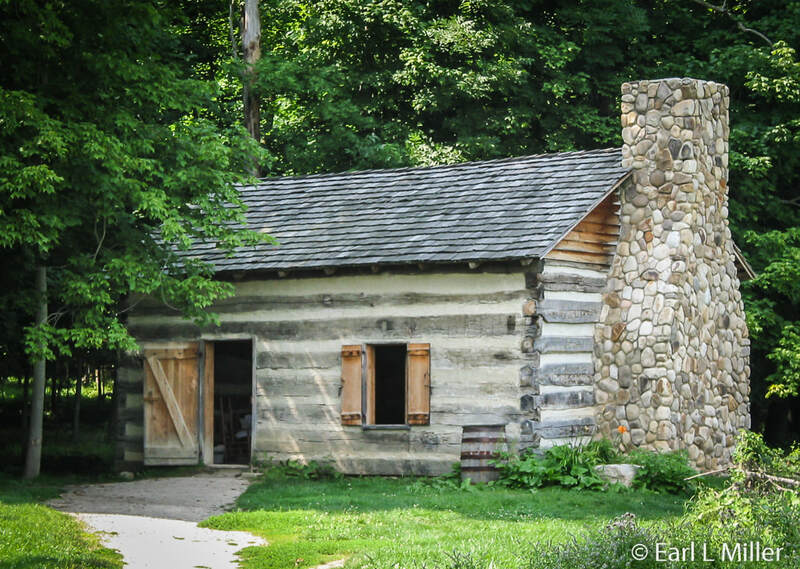 There are no differences in log structures inside or outside of the Western Reserve. No log structures were available in the Western Reserve. Originally, it was a single-story farmhouse with a second story later added. It was then used as the first Catholic school in Columbiana County, a parsonage, and a grocery store. Finally, it became a farmhouse again. Its interior is based on the Connecticut school plan of the period. In the schoolhouse, girls sat on one side and boys on the other. When they were being taught a specific subject, they sat on the middle bench. Different subjects and grade levels were rotated throughout the week. The school started at 8:00 a.m. and ended at 4:00 p.m. with a break for lunch at noon for an hour-and-a-half. Most students had lunch pails unless they lived close by when they would return home. School ran from September 1 until the end of May from Monday through Friday. 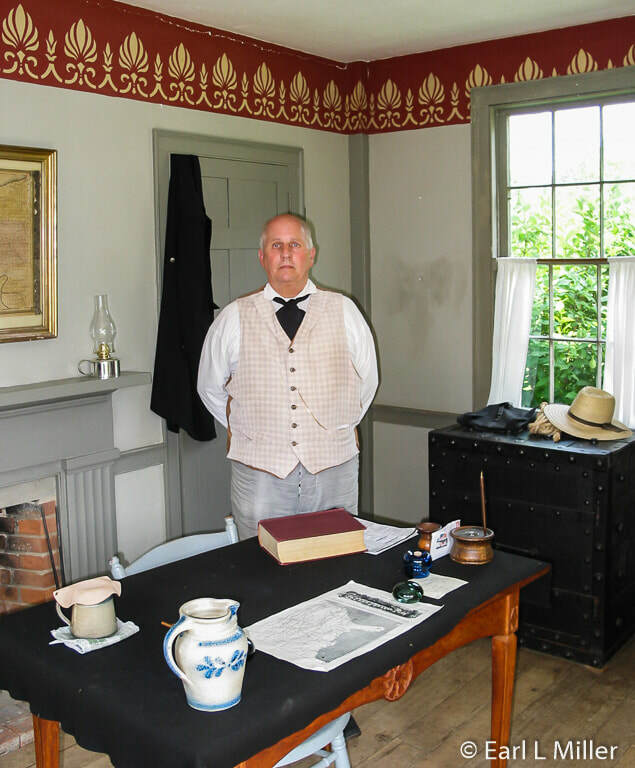 In 1832, after Ephraim Brown bought the entire town of North Bloomfield, he built the small land office now located at Hale Farm and Village. The purpose was to have a place to practice his land business and other commercial pursuits. The structure, which arrived in 1983, is now used to interpret the history, survey, and settlement of the Western Reserve. I think the Wade Law office is the most historical. 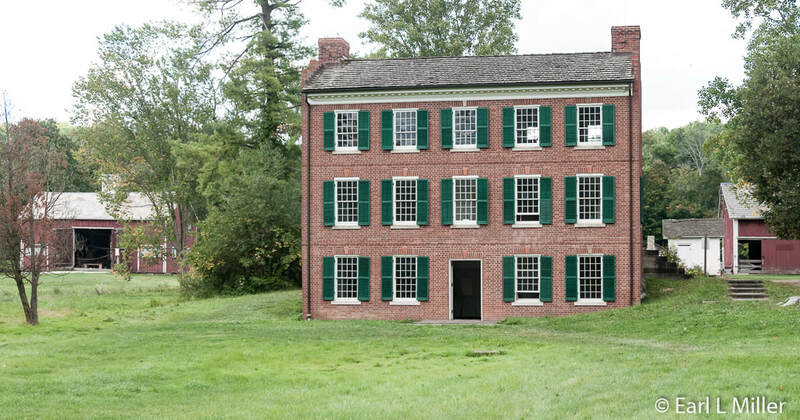 This 1825 structure comes from Jefferson, Ohio where it served as the law office of Benjamin Franklin Wade. He was an abolitionist and United States Senator. In 1868, Wade missed by one vote becoming president of our country during President Andrew Jackson’s impeachment since he was “pro tempore” of the Senate. The office contains many artifacts related directly to Wade. 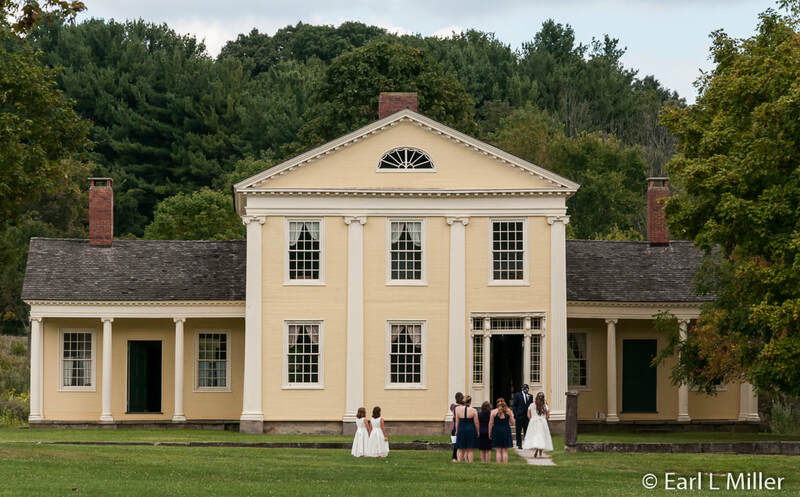 A major building on the village green, the 1852 Mary Ann Sears Swetland Memorial Meetinghouse, can be rented for weddings. It first served as a Baptist meetinghouse and later was occupied by a Methodist congregation until 1969. A severe wind storm destroyed its steeple in 1957. However, after careful research, Hale Farm was able to rebuild it. The interior reflects its use as a Baptist church with all pews and wainscoting being original. The altar was completely reconstructed. Not original to the church is the basement which serves as a community meeting room with modern public restrooms. 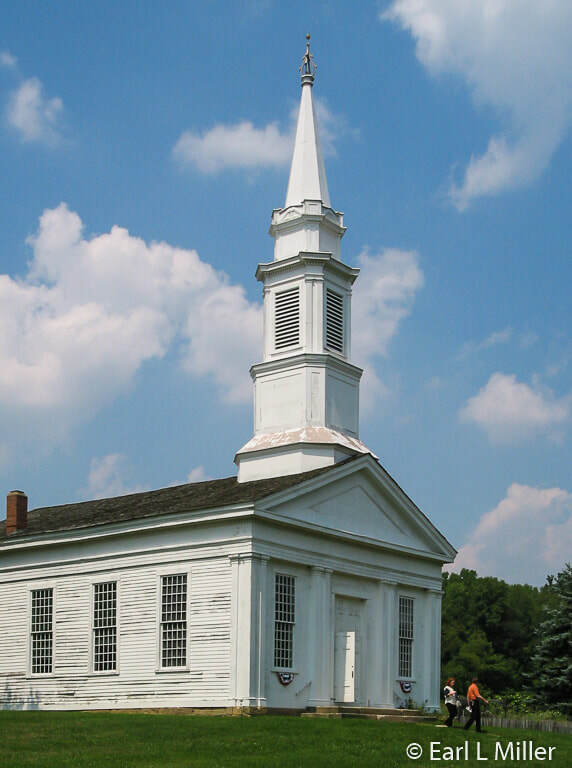 Meetinghouses in the 1800's served several functions such as being a town hall, public works building, and place of worship. 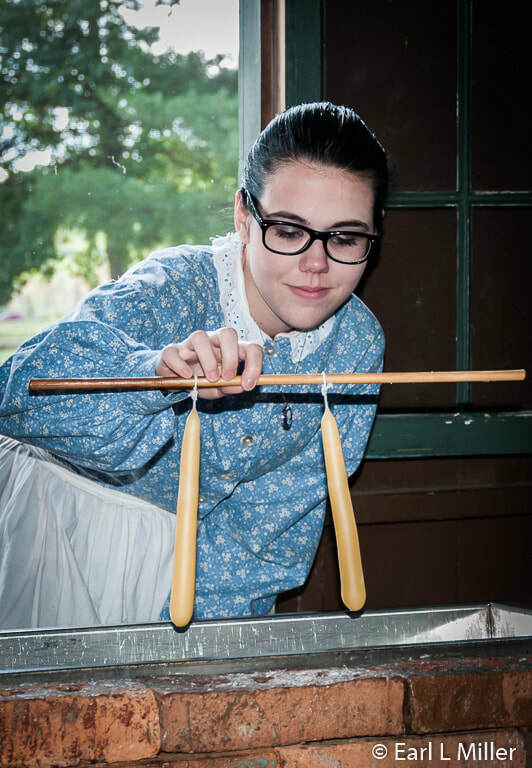 Trades like glass blowing, blacksmithing, and a potter are found opposite the Hale House. You’ll find the pottery in a production shed using 19th century techniques such as a potter’s wheel. 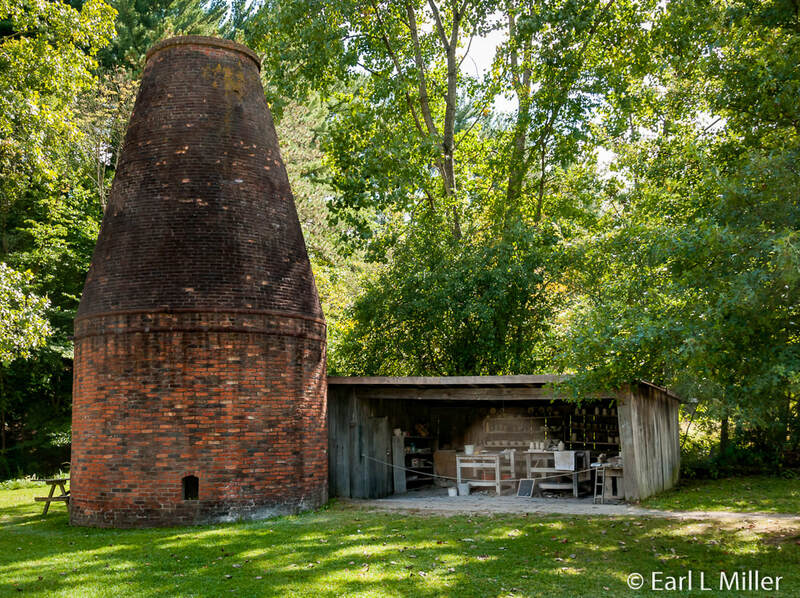 Look for the brick bottle-shaped kiln which houses a furnace for firing the salt glazed pottery produced on the site. Unfortunately, the potter was not there when we were. In 1828, a large bed of clay was discovered near Akron. By 1841, eight pottery shops were in operation. The industry continued to grow in the 19th century making Summit County the second largest stoneware production area in Ohio. Potters manufactured redware which was used for a variety of utilitarian products. Up the hill is the glassworks demonstration barn, a mid 19th century structure from Stow. Here crafters follow 19th century glass blowing techniques. You can purchase their products at Marketplace. The manufacture of glass in the 1820's and 1830's was a major industry in Ohio with several factories in northeast Ohio producing it. Glass manufacturing remains prominent today in Toledo, Ohio. 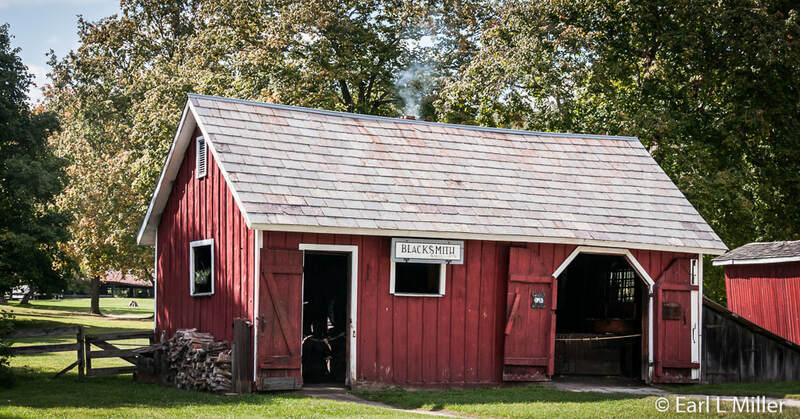 You can also visit the blacksmith at an 1805 Tallmadge, Ohio log structure. They work with wrought iron and steel to make utilitarian items such as hinges, tools, and chains. Watch the metal get heated to about 2000 degrees, then hammered, and worked on an anvil into the required shape. 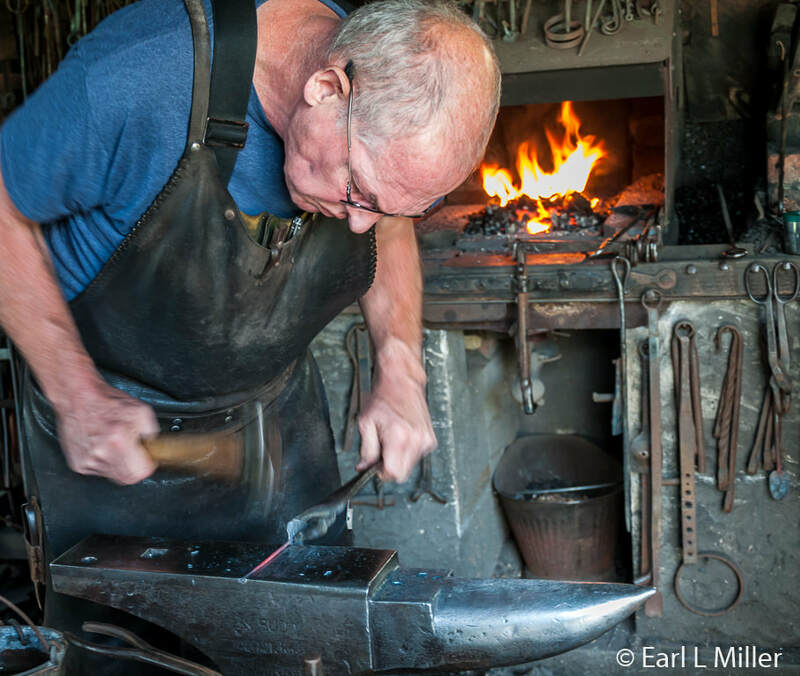 We spoke to Marty Resig, who has been the blacksmith at Hale Farm and Village for more than 40 years. He was making decorative leaves on which he uses seven different hammers. Hale Farm and Village is a seasonal attraction, open Wednesday to Sunday, June to August, from 10:00 a.m. to 5:00 p.m. In September and October, it's open weekends from 10:00 a.m. to 5:00 p.m.. It is located at 2686 Oak Hill Road in Peninsula. The telephone number is (330) 666-3711. Admission is $10 for adults, and $5 for children ages 3-12. For more information, visit their web site. They do hold some kind of special event from March through December. For example, in March, they hold their Maple Sugar Festival and Pancake Breakfast for two weekends. 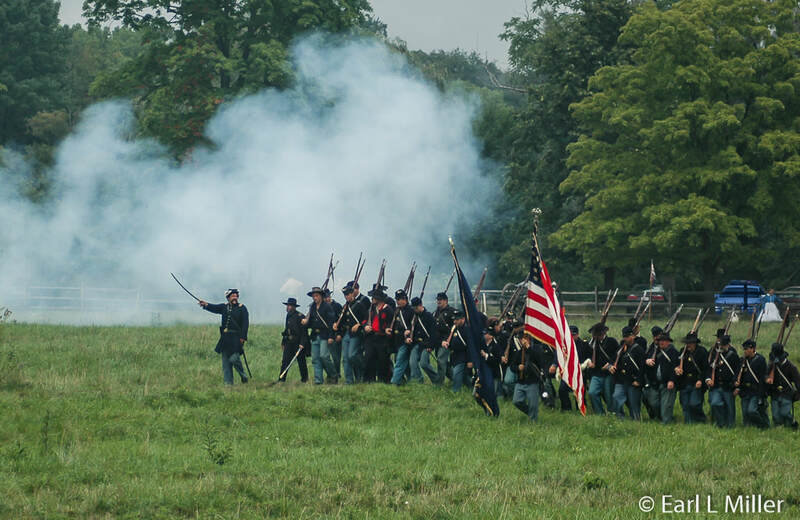 Their Civil War reenactment is held the middle of August. The Made in Ohio Art & Craft Festival occurs the first weekend in September.